I’ve recently returned all inspired from wonderful days of music at Womadelaide. It was such a pleasure and a privilege to have my teacher Toumani Diabate and his son Sidike here from Mali – To be able to show them the beautiful beaches of Sydney, to be reminded of all I love about West African music and to have the opportunity to perform with them at Sydney’s Angel Place. 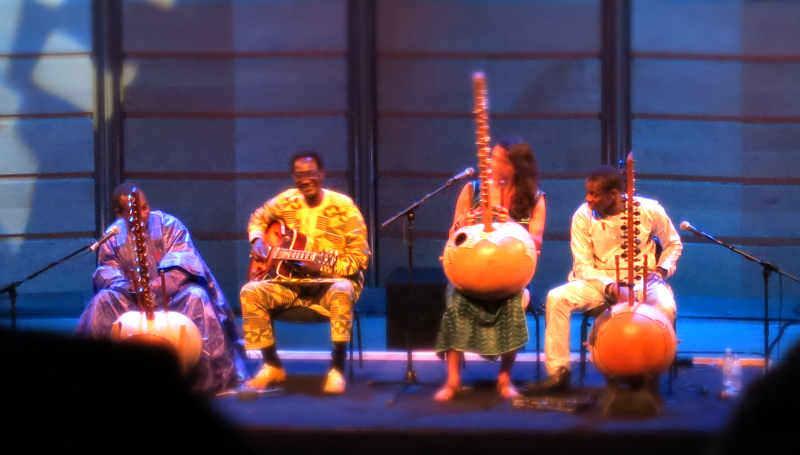 It really was quite daunting to get up with two kora legends , along with talented local Malian guitarist Mousa Diakite to sing and play in that beautiful theatre full of people. From there I went on to Womad where I got the opportunity to jam with members of Buena Vista social Club after their concert and to both hear and hang out with other inspiring musical legends like Youssou N’dor from Senegal and my childhood indie cassette tape favorite Neneh Cherry, who came to life free style jamming at the artist after party till 5am. The other most inspiring occasion was the Women’s day event at Macquarie University- I performed and spoke on a panel where everything from celebrations of Woman’s day at a refugee camp in Darfur to emergency medicine in Bosnia to the way music lifts the spirit were discussed. I was deeply touched and privileged meeting these women and being part of such an event. Looking to the near future I’m especially looking forward to performing at Colbourne Avenue in Glebe next Thursday evening. This will be the last trio gig in Sydney that includes the wonderful combination of Kate Adams and Lara Goodridge for quite some time . – Kate is soon to welcome a little one into the world and Lara soon to go on tour to Europe with Fourplay so if you haven’t seen our special trio please come to this one! Another event of a different ilk I’m looking forward to is playing alongside talented pianist Katy Tsai in her music meditation event this Sunday on Sydney’s North Side. This is an event where the audience get to experience the music lying down within a guided meditation. Further afield next month are some shows in Melbourne where I will be performing alongside the lovely double bass player Liz Frencham as well as energetic Afrobeat big band The Marabou project on the 18th of April. Later in the month is a tour in North Queensland but more on that later. Leaving you in the spirit of Women’s day just past with a quote written by a woman some time ago that is still as pertinent as ever. It’s always nice to hear from you too. p.s Details on upcoming gigs are below. – 25th March – Oasis Music Meditation Event with Katy Tsai on piano and myself facilitated by Linda Kerr.